One easy elegant main dish with flavor packed leftovers. I started out to create one recipe and got two pork leftover recipes instead! It’s always extra satisfying when a night’s work does double duty. The initial idea was inspired by the tomatillos themselves. They have a beautiful, bright acidity that’s very refreshing and perfect for summer. I thought the tang of the sauce would complement the sweetness of roasted pork, and the combination is delicious. When sliced, the pork tenderloin rounds are elegant enough for a dinner party. Additionally, the sauce is really versatile and can be used in many ways, so go on and get creative. Since it’s just my husband and me at home, we had plenty of pork and sauce left over, so I had a chance to play around to develop a second dish and created the enchiladas below. If you finish all the pork but have sauce leftover, just substitute in your protein of choice or add extra veggies. Instructions For the Pork: 1. Rinse pork tenderloins, transfer to cutting board, and pat dry. Butterfly the tenderloins by slicing them through the center of the lengthwise, being careful not to slice all the way through, and gently opening them like a book. 2. Ease one loin open until it lies flat. Pound the loin with a meat mallet to flatten the loin. Repeat with the second loin. 3. Transfer the tenderloins to a large bowl. Rub the cumin, garlic powder, and pepper onto the surface of the meat. Pour the beer and lemon or lime juice over the tenderloins. 4. Cover and refrigerate for at least one hour. For the Cilantro-Garlic Paste: 1. Roughly tear or chop the cilantro and put in a blender. Add the garlic, half of the olive oil, a pinch of salt and pepper. 2. Blend. Add more oil as needed. The consistency of the paste should be like a thick pesto. 3. Adjust seasoning and reserve. For the Tomatillo Sauce: 1. Warm oil in a sauté pan, add the onion, and sweat over medium-low heat until tender, stirring occasionally. If the onions begin to caramelize before fully softened, add a splash of water to slow the cooking. 2. Once the onion is soft, add the tomatillos, and continue to cook over medium-low heat until the tomatillos are softened. Again, if the tomatillos begin to brown, add a bit of water to slow cooking. 3. 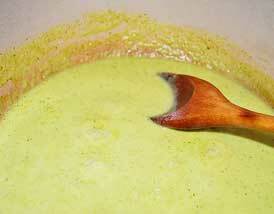 Once tomatillos are softened, transfer the mixture to a blender. Add 2 Tbsp of the reserved cilantro-garlic paste to the mixture, along with a pinch of salt. Blend until smooth. Taste and adjust the seasoning. If the sauce is too thick, add a bit of water. 4. Pass the sauce through a fine mesh strainer. Note: This step is optional. Passing it through the strainer creates a smoother, more elegant appearance. If you prefer a slightly chunky sauce, skip this step. 5. Reserve. Note: Make sure to clean the tomatillos well as they can have a sticky coating between the skin and the husk. To Assemble Pork: 1. Preheat oven to 450°F. 2. Remove pork from the marinade and pat dry. 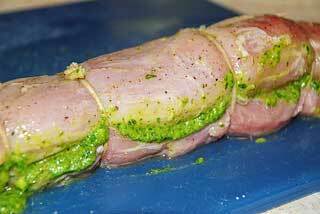 Lay the first tenderloin flat, cut side facing up, and rub half the reserved cilantro-garlic paste on top. Roll the tenderloin as compactly as possible. 3. Secure the tenderloin with three to four pieces of kitchen twine. Repeat with the second tenderloin. 4. Rub the outside of each tenderloin with a small amount of cooking oil. Sprinkle salt and pepper over the tenderloins. 5. Heat cooking oil in a large pan. Transfer the tenderloins to the pan and sear, turning until all sides are nicely browned. (If you don’t have a pan big enough to fit the two tenderloins, cook in two batches.) Transfer the tenderloins to an roasting pan and put in the oven. 6. Roast the pork in the oven for 15-20 minutes, or until a thermometer inserted into the thickest portion of the meat reads 145°F, turning the tenderloins once. 7. Remove the pork from oven and transfer to a cutting board or cooling rack. Allow the pork to rest for 10 minutes. 8. While the pork is resting, warm the reserved sauce in a saucepan over medium heat. 9. Once the pork is well rested, remove the kitchen twine. Slice the pork into rounds. Serve the pork with sauce. I love your page. !!!!! !